The harlequin bug is an important insect pest of cabbage and related crops in the southern half of the United States. This pest has the ability to destroy the entire crop where it is not controlled. 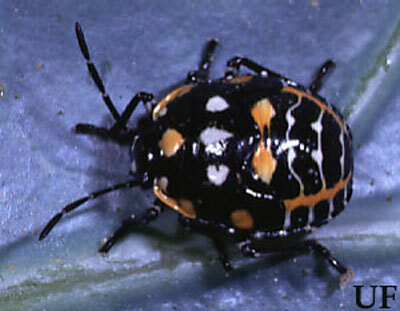 The harlequin bug injures the host plants by sucking the sap of the plants, causing the plants to wilt, brown and die. The harlequin bug is a southern insect ranging from the Atlantic to the Pacific coasts. This insect is rarely found north of Colorado and Pennsylvania. It first spread over the southern United States from Mexico shortly after the Civil War. A generation of the harlequin bug requires 50 to 80 days. The life cycle consists of three stages: egg, nymph and adult. Harlequin bugs pass the winter as adults (commonly referred to as stink bugs) and true hibernation is doubtful. 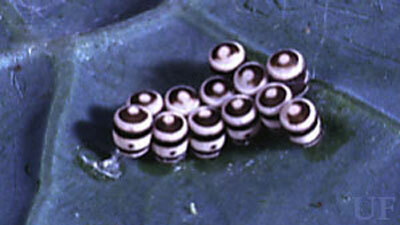 Eggs: Eggs of the harlequin bug resemble tiny white kegs standing on end in a double row (Figure 1). Approximately 12 eggs are laid together in one batch, usually on the underside of the leaves of the host plant. Each egg is marked by two broad black hoops and a black spot. The eggs hatch in four to 29 days, the time varying with the temperature. Figure 1. Eggs of the harlequin bug, Murgantia histrionica (Hahn). Photograph by James Castner, University of Florida. Figure 2. 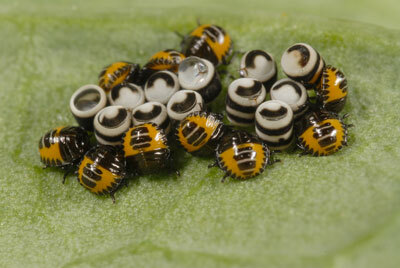 Eggs and nymphs of the harlequin bug, Murgantia histrionica (Hahn). Photograph by Lyle Buss, University of Florida. Nymphs: There are five or six nymphal instars that feed and grow for four to nine weeks before they are capable of mating. The head coloration of the nymphs ranges from pale orange (in first instar), darker (in second to fourth) to black (in fifth instar). Antennae of first instars are colorless and darken to black with each progressive molt. The thorax ranges from pale orange in first instars to a final pattern of scarlet, white, yellow and black in the fifth or sixth instars. The abdomen coloration progresses similarly to that of the thorax, getting showier with each progressive molt. Figure 3. Nymph of the harlequin bug, Murgantia histrionica (Hahn). Photograph by James Castner, University of Florida. Adults: The adults are gaudy red-and-black-spotted stink bugs about 9.5 mm long, with flat, shield-shaped bodies. At rest, the front pair of wings overlap and the insect's back appears to be marked with a distinct X. Figure 4. Adult harlequin bug, Murgantia histrionica (Hahn). Photograph by James Castner, University of Florida. Plants commonly attacked by the harlequin bug include such crucifers as horseradish, cabbage, cauliflower, collards, mustard, Brussels sprouts, turnip, kohlrabi and radish. In the absence of these favorite hosts, tomato, potato, eggplant, okra, bean, asparagus, beet, weeds, fruit trees and field crops may be eaten. The harlequin bug feeds on its host plant by sucking the plant's juices. The literal "sucking-to-death" of the host plant results in wilting, browning, and eventual death. Throughout most of its range, the harlequin bug continues to feed and reproduce during the entire year. Further north, the approaching winter drives the bugs into the shelter of cabbage stalks, bunches of grass, and other rubbish. Adults are usually the only stage to survive winter conditions. During the first few warm days of spring, the adults emerge by the time the earliest garden plants are set out. Figure 5. Feeding injury by harlequin bug, Murgantia histrionica (Hahn). Photograph by James Castner, University of Florida. Cultural control. 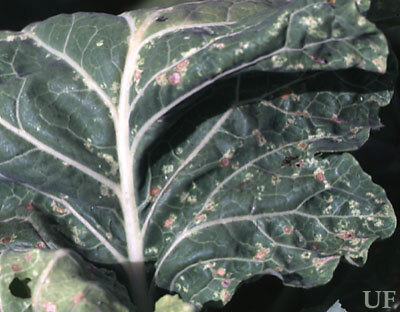 Hand-picking and destruction of the insect pests and egg masses may deter damage where low numbers of insects are found. Hand destruction of the adults in the fall and spring as they emerge from "hibernation" before they lay eggs is an effective control. This may be aided by the use of trap crops such as turnip, kale, or mustard in very early spring or late in the fall after the main crop has been harvested. Once the pests have concentrated in these areas, they can be killed by applying insecticides or by covering the trap crop with straw and burning. Trap crops should never be used unless they can be given careful attention to destroy the bugs attracted to them. Anonymous. (Unknown). Key to bugs. Insect and Related Pests of Flowers and Foliage Plants. (17 August 2012). Ghidiu GM. 1988. Harlequin bug. FS-Cooperative Extension Service. Rutgers University, NJ. (246) 20. ill.
Miller MC. 1971. Regulation of populations of the harlequin bug, Murgantia histrionica, by egg parasites. Journal of the Georgia Entomological Society 6: 255-257. Paddock FB. 1918. Studies on the harlequin bug. Experiment Station, TX. Texas Agricultural Experiment Station Bulletin 227. Smith JB. 1897. The harlequin cabbage bug and the melon plant louse. Experiment Station, NJ. New Jersey Agricultural Experiment Station Bulletin 121. Sullivan MJ, Brett HC. 1974. Resistance of commercial crucifers to the harlequin bug in the coastal plain of North Carolina. Journal of Economic Entomology 67: 262-264. Thomas WA. 1915. 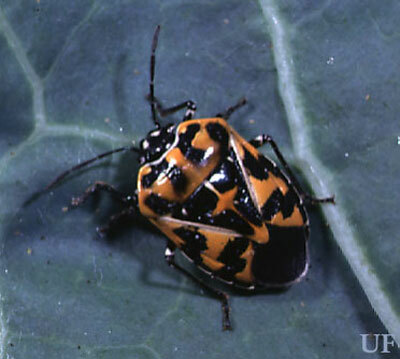 The cabbage harlequin or calico bug. South Carolina Agricultural Experiment Station Bulletin 28. Publication Date: February 1998. Latest revision: October 2015. Reviewed September 2018.